"It feels a bit ridiculous to hold Facebook to a standard far beyond what any other messaging service has." People will hold the subjects of their hate to the highest of standards. is no reason not to trust them. I mean, can you imagine what would have happened if Britain hadn't trusted Hitler just because the Nazi's were evil? Masnick falls for it, but even NYT can't! So I'll just go on Facebook's history. This known spy center / monopolist / totally unethical mega-corporation has to prove overwhelming reasons why SHOULDN'T / MUST NOT be broken up into tiny pieces. Re: Welcome back Zombie "Zauber Paracelsus"! "You" began 19 Apr 2010, so 8 comments average per year, way down last two, of course. Now you're back for a one-liner. 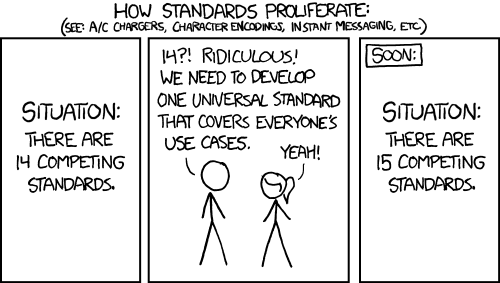 A standard to chat with Facebook users was already available: XMPP worked until recently. The end-to-end encryption is provided by OMEMO on some clients (https://en.wikipedia.org/wiki/OMEMO ). So it's pretty easy to increase the people's confidence that Facebook truly believes what it says: start by bringing back XMPP and contribute some patch to the most popular apps so that they work well with it. And yes, Google should do the same with its services. The only way Zuckerberg can fix Facebook is to remove it entirely from the internet. I know, but the statement is still a fact. In order to write something like this with a straight face, you'd have to completely ignore the history of both Facebook and Mark Zuckerberg's actions and lies. This blog is an embarrassment. OTR (Off-the-record) and its successor OMEMO do, and they're widely supported. There's an official protocol document and everything. First of all, as we've pointed out in the past, spreading disinformation is more of a human problem, rather than a technology problem, and it's a bit bizarre to blame the technology for the disinformation. Not necessarily. While you're technically correct here, the part you're not addressing is technology's role as a force multiplier: it takes human problems and makes them much, much bigger. So it's definitely reasonable to look into what can be done to mitigate that side of the problem. BTW, when existing standards are missing features, adding those features should always be considered as a way to avert the XKCD prophecy. Ahh, yes. Bandaids - always bandaid first and THEN address the problem. We have criticized Facebook quite frequently and will continue to do so (frequently, I imagine). Is your brain so clouded and so "black and white" that you have no room for nuance, and no ability to support a company doing the right thing, even if it's done many bad things before? How is "slimy" to point out a possible path for Facebook to not be so slimy? I get it. You're cool. You're hip. Facebook is evil and you don't like me, so it's fun to take a cheap shot with NO analysis, NO thought, NO actual argument, but just attack me. This is especially true given how the disinformation spread via Facebook, WhatsApp, and Instagram affects people that don't use Facebook. I don't use anything of Facebook's, but I have to contend with events that occur because of the conspiracy theories and anti-vaccine quackery that gets spread on it. People have to deal with how social media's megaphone powers enabled a fascist to rise to power in Brazil and made it easier for ethnic cleansings to happen in a nation where political and social divisions were already at a boiling point even if they don't have an account on those social media platforms. Facebook and others can do better and have to do better. Well isn't that nice for everyone in the Facebook ecosystem? They should work to respect the decisions of people who don't want anything to do with that Facebook ecosystem, as well. But that's money that they're leaving on the table, so they won't. Are you...being sarcastic? Because it sounds like you're suggesting that "first, stop the bleeding" is a bad strategy. Godwin's law does not claim to identity fallacy. So, how's the Facebook stock doing, bro? Some people actually think it is better to remove the snake before bandaging the bite. Go figure. "...we aren’t really using the content of messages..."
does not mean the same thing as "...we don't use the content of messages...". If anything, it's implicit that Facebook does use some content of messages for advertising. "Facebook and others can do better and have to do better." The problem then is that Facebook and 'others' become the defacto arbiters of what is right or wrong. Personally I don't want them to be the arbiters of what is right or wrong. So far as the conspiracy theories and anti-vaccine quackery, I would suggest that members of Facebook and 'other' step up and communicate. If there are more of them than you, then one needs to speak longer, and more forthrightly, and with more provable, quantifiable, qualitative facts, with links to sources. They, in the end, will not be able to keep up with that. Yes it is a lot of work, and not being a member of Facebook or 'others' I don't know how the systems operate, but I do know that while you may not change the minds of the incoherent, the message of supported honesty does get through. We tolerate the incoherent to some degree here on Techdirt. We let them speak, but have the option to flag their posts, which minimizes them though still readable (well, depending on how coherent or incoherent they are at any given time) and also have the option to feed their zealotry or not, and too often we feed rather than not. That would leave the argument you want to have with Facebook and 'others' is how to come up with a system that, with some similarity to Techdirt, allows all to speak, but gives options that to, let us say downgrade, those posts that cannot, or will not produce any verifiable facts to support their conclusions. Because he said, is not sufficient without 'his' credentials and some accredited work in the field, or something similar. even if it's done many bad things before? Re: Re: Welcome back Zombie "Zauber Paracelsus"! Why's this always a big deal for you? I just recently decided to start getting more involved in the comments and you've already leaped all over my back twice. People can be ephemeral on the internet - it costs us very little. I've joined, left, and later rejoined services many times. This analogy has gotten rather far afield. What exactly is the point you're trying to make? Assuming for the moment that this is true (and I think you will find, if you look around some comments section here, that "people who believe in nonsense will eventually listen to reason if you just speak to them rationally for long enough" is a false premise) -- how many people are dying of preventable diseases in the time it takes to convince anti-vaxxers that they're wrong? It is perhaps the most misunderstood law of the internet. It actually states that as a discussion continues, the probability of someone mentioning Nazis approaches 1. Many people think it says if you mention Nazis you lost. allows all to speak, but gives options that to, let us say downgrade, those posts that cannot, or will not produce any verifiable facts to support their conclusions. Maybe not a bad idea, but don't fool yourself into thinking that's all a downgrade option will be used for. Inevitably, it will be an "I don't like this post" button.